Defender Ben Mee says that the Clarets are continually showing that they can mix it with the Premier League’s ‘big six’ despite losing out in a game of two halves against Manchester City. 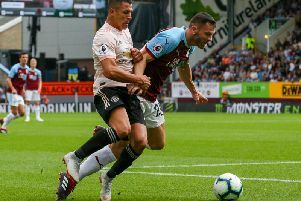 Burnley became only the third team this term to get their noses in front at the Etihad Stadium when Ashley Barnes opened the scoring in the 25th minute but they were unable to hold the hosts off after the interval. Sergio Aguero sent City on their way to the fourth round of the FA Cup with two goals in as many second half minutes before Leroy Sane and substitute Bernardo Silva sealed victory to stretch their side’s record to one defeat in 45 at home. After the Clarets restricted Pep Guardiola’s men in the first half, Mee said: “They’re a top quality side, another level to what we are. “Whether we’re getting closer or not is difficult to say but we’re a team that’s growing and we’re performing really well at a high level at the moment. We’re definitely growing as a club and a team. He added: “We gave it a good go, we were well in the game, we gave them a good test, gave everything we could and it was a decent cup tie in the end. Once they got their tails up though it was difficult to regroup. “We defended really well (in the first half). We went out there and pressed them and got in their faces a little bit. “They were probably expecting that but we had a good attitude and a good mentality. We limited them to few chances. With more than 7,500 travelling fans - around 10% of the town’s population - making their voices heard from the stadium’s South Stand at the weekend, Mee added: “It would definitely have been great to have a good cup run, especially for the fans who turned up today because they were fantastic. “I think 10% of Burnley’s population was here this afternoon, it was brilliant to see and fantastic for them. I hope they could see the lads giving everything for the shirt and for the team. “Hopefully they were pleased with our performance and understood the job that we had on our hands. “It’s fantastic and I would like to think that they’re enjoying their time as a Burnley fan at the minute. “It’s a fantastic time to be following us, we have a great following and the lads know that. We all appreciate it.